Hello folks, I am back here again...! Being a Java fanboy, I keep myself indulged with writing some sort of applications or code snippets in Java in my leisurely time. 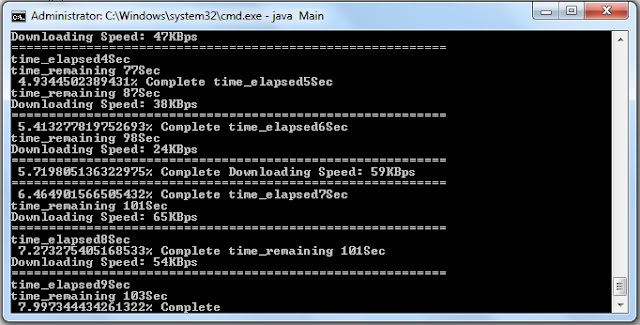 During last few months I have been working on this Java download manager...Its nothing but a simple program having lots of classes and files etc. But most importantly, there are many threads of program execution.This download manager is not a kind of some professional software, its simply a single segmented multi-threaded download manager. Multi-threading being one of my programming manias as foretold on my About Me page. The whole download manager is based on just a following Classes in Java. Though I have added some more classes to create the Software Application user interface(UI) in Java. With the above code the file located at a specific URL is downloaded and saved to the local disk. I have packed the whole simple read-write program into Java Swing desktop Application. This way I also got to learn a little bit of a Java Swing API. The following screen-shot depicts the program activity on the console or command prompt. I believe and assure that this is a software written just out of interest, but your comments and criticisms are always welcome anywhere on The4thdimension. Sorry, I did not publish the code. I had built it back in 2011, had the source code for a while. Did not know ways to share it online back then. And now I lost it. I think the explanation about it should give you an idea.